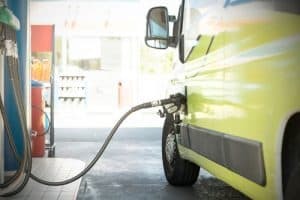 Ford has announced the introduction of a new technology aimed specifically at helping fleet operators to reduce their fuel consumption. The EcoGuide system will assess the road ahead of a vehicle and advise the driver on the best time to brake. Michael McDonagh, Transit global chief programme engineer at Ford of Europe, explained: “Everyone has experienced occasions when we have to brake suddenly if a bend is tighter than expected, only to speed up again afterwards. The system uses the vehicle’s sat-nav to pre-empt driver behaviour and to advise users of when would be the ideal time to brake and accelerate. By doing so, it ensures motorists are smoother in their driving, helping to save fuel and making journeys less stressful. Indeed, Rebecca Ashton, head of policy and research at IAM RoadSmart, supported these claims, arguing that avoiding unnecessary braking and acceleration can help to boost fuel efficiency by up to 12 per cent. The EcoGuide system is set to be installed in the new Ford Transit and will also feature in all upcoming models from the manufacturer. It aims to ensure users are being optimally efficient in the way they carry out their journeys, with an expanding/contracting halo HUD to alert drivers as to the best time to brake, accelerate and change gear.